AMCI’s ANG1E integrates drive and motion control technology, simplifying installation and cutting costs. Move commands are easily programmed through the host PLC software, and cabling is drastically reduced by expanding up to 6 axes of motion over a single network connection. Advanced Micro Controls Inc. (AMCI), releases their highly anticipated stepper motor indexer/drive package with network communication. AMCI’s new ANG1(E) integrates drive and motion control technology in one package, simplifying installation and cutting costs. The drive/controller communicates with the host PLC over the EtherNet/IP or Modbus-TCP network. Move commands are easily programmed through the host PLC’s software, and cabling is drastically reduced by expanding up to 6 axes of motion over a single network connection. The ANG1(E)’s revolutionary product design makes it a perfect solution for new installations or controls upgrades. 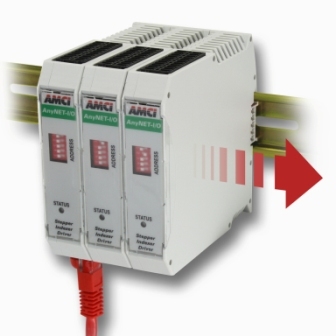 AMCI’s ANG1(E) integrates a stepper controller and driver into one, compact package that communicates with the host controller (your PLC or PAC) over the network. The indexer/drive easily mounts on a standard DIN rail, simplifying installation and lowering costs. The ANG1(E) easily expands from 1-to-6 axes of motion control by stacking additional controller drives onto the “master”, and only requires a single network connection for all axes of control. This innovative product design simplifies installation, optimizes network performance, and ensures system integrity. Combining stepper and servo technologies, AMCI’s ANG1(E) delivers exceptional performance across a range of applications. The ANG1(E) provides excellent low speed, high torque motion control (like a stepper), and can be equipped with encoder feedback to deliver closed loop performance (like a servo). Applications benefiting from this new technology include low speed, high torque applications involving repetitive motion; as well as applications that require dynamic performance related to shifts in load.